Taking John Constantine out of England and making him an American is a bit like taking Sherlock Holmes out of Victorian London and recasting him as a contemporary New York police detective. What you're left with isn't Holmes, but a character vaguely similar to Holmes, like Detective Robert Goren of "Law & Order: Criminal Intent." Photo Copyright © Warner Bros. Created by Alan Moore ("Watchmen"), Constantine first appeared in the pages of DC Comics' "Swamp Thing." Since then, he has enjoyed a lengthy run in his own book, "Hellblazer," part of DC's Vertigo imprint. In the comics, Constantine is a magician. He operates in the shadows, fighting evil when he must, but often calling in favors or tricking others into doing his dirty work for him. He is also a bit of a jerk, to put it politely. Despite altering Constantine's nationality and moving him to Los Angeles, the movie "Constantine" takes part of its story from the "Hellblazer" comics, specifically those written by Garth Ennis and collected in the graphic novel "Dangerous Habits." As a comic-book adaptation, "Constantine" is a mixed bag. It isn't as respectful of its source material as the "Spider-Man" movies are, but it's no "Catwoman," either. Still, what you want to know is, how well does "Constantine" stand on its own, just as a movie and not as a comic-book movie? And the answer is, surprisingly well, actually. 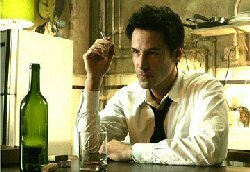 John Constantine (Keanu Reeves) has a problem. He has terminal lung cancer from smoking 30 cigarettes a day since he was 15, but that's not his problem. His problem is that when he dies, he is destined to go to a place that has no pearly gates and no singing choirs. His "good works" on Earth, such as sending demonic "half-breeds" back to where they belong, are getting him nowhere because he committed a mortal sin (murder, but it isn't as simple as that) and has lived a rotten, selfish life. Supernatural trouble is brewing, too. Full-blooded demons, supposedly incapable of entering our plane of existence, are showing up in alarming numbers, indicating that something major and unpleasant is on the horizon. By a combination of chance and ghostly intervention, Constantine crosses paths with police detective Angela Dodson (Rachel Weisz), whose twin sister, Isabel, is dead in an apparent suicide. But Angela doesn't believe that Isabel, a devout Catholic, could have killed herself. With no evidence to prove that Isabel was murdered, Angela turns to Constantine for help, and he promptly tells her to get lost. That is, until he learns that some of those demons that aren't supposed to be here are after her. Constantine's investigation takes him into a supernatural underworld. We meet his faithful "chauffeur," Chas (Shia LaBeouf); Papa Midnight (Djimon Hounsou), the proprietor of a bar where demonic types can meet on neutral ground; and other colorful characters. The most memorable of the lot are Tilda Swinton ("Orlando") as the angelic half-breed Gabriel, who tells Constantine in no uncertain terms that he isn't getting into Heaven, and Peter Stormare, who plays a wonderfully repulsive Lucifer. The direction by first-timer Francis Lawrence isn't bad, and the acting is good enough, with Reeves finding comfort in a role that doesn't demand more than he can deliver. Overall, "Constantine" is an entertaining supernatural thriller that unfolds like a 1940s detective story up until the end, when it resorts to action-movie cliches. Fortunately, Constantine's final solution to his and the world's problems is a bit more subtle and satisfying.